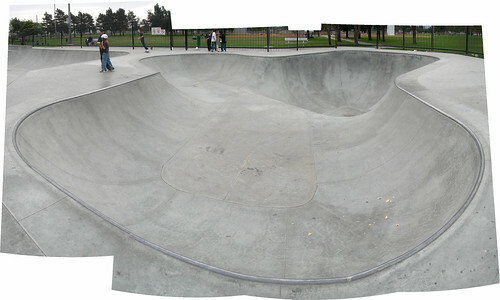 Chino Skatepark 2, originally uploaded by Sassberto. This was a weird clover with 4 foot shallow-end trannies and an 8 foot deep end. The proportions are out-of-wack – you drop 4 feet down the waterfall into the deep end, making it hard to keep a good flow without flying over the thing. Still fun, the mini-ramp champs enjoyed the shallow end. This entry was posted in Skateboarding on November 12, 2006 by Sassberto.